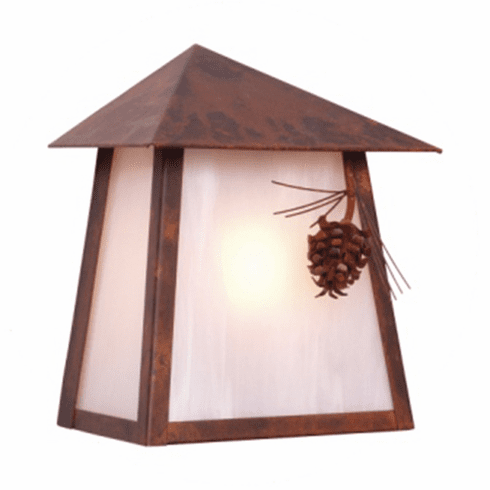 This Rustic Lodge Wet Location Ponderosa Pine Tri Roof Wall Sconce is available in several lenses and finishes. The picture shows rust finish and slag glass pretend lense. The light is 10.5inches high, 9inches wide and 5.5inches extension. It uses 150 watt bulb. Please allow 3 to 4 weeks for this item to ship as each is crafted-by-hand and made-to-order with the specific finish and lense option chosen by the client, one at a time. Therefore, returns are only reviewed for approval on a case-by-case basis.